Synopsis: Experience a new art adventure inside every. the amulet of amser book. wen's very first fantasy adventure in the middle-grade chapter book series- the amulet of amser: the case of the Mona Lisa. blending history with fiction, children learn about famous pieces of art. wen, the youngest member of the amser family,is destined by his family's ancient oath to forever protect the world's most precious pieces of art for all of mankind. during a visit to his grandfather's house; wen learns that he can influence what will happen tomorrow by going back in time. 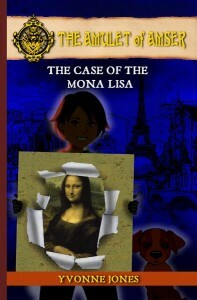 will wen be able to save the Mona Lisa, or will Leonardo da vinci's masterpiece be lost forever? Review: first of all l would like to say a big thank you to Yvonne Jones for sending me this book and giving me a chance to read it l was sent this book in exchange for a honest review. l am glad this book is on my bookshelf. l would tell people to step outside your comfort zone with books because it is good to add more authors and genres to your reading portfolio even if you do not read books like this. normally l would not read book of this genre but l stepped outside my comfort zone with authors and genres l am so glad l did because l have read so many great books along with this book l got a little card off the author. the author kindly signed my book as well and wrote the greatest gift we can give our children is a passion for reading l love this saying l really enjoyed reading this book l loved reading about the amser family and them travelling back in time to safe precious art work. this book was easy to get in to and l highly recommend this book to anybody. this book is only 40 page story but it is a great storyline. l would love to read more about the amser family and more from this author l could not put this book down once l started reading it.l loved the pictures in this book.